reading and recommending books and film. Do you believe in life after death? Slog does. He believes that the scruffy man on a bench outside the butcher shop is his dad, returned to visit him one last time. Slog’s friend Davie isn’t so sure. Can it be that some mysteries are never meant to be solved? And that belief, at times, is its own reward? 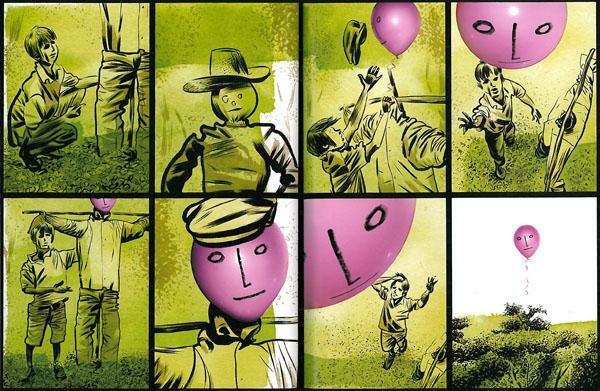 The acclaimed creators of The Savage reunite for a feat of graphic storytelling that defies categorization. Eerie, poignant, and masterful, Slog’s Dad is a tale of astonishing power and complexity. 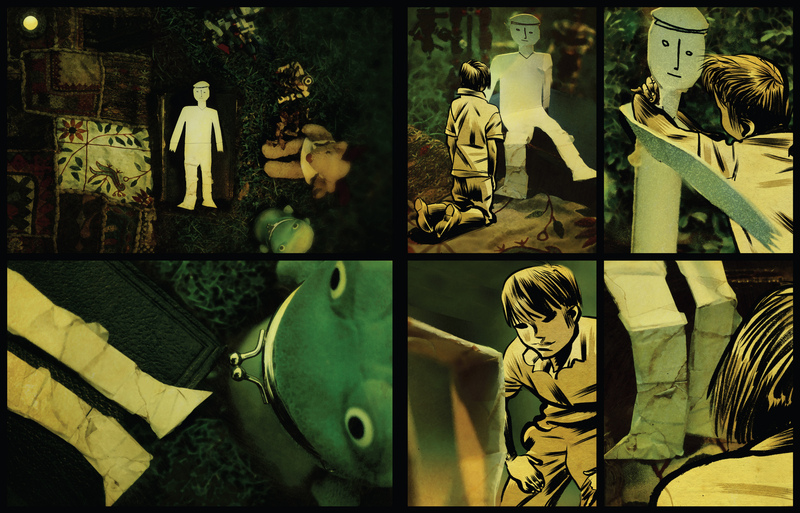 & Dave McKean (as Illustrator). I know there is a lot of debate in the use of the term Graphic Novel over Comic or Long Comic, and sometimes Picture Book. Shaun Tan writes Picture Books for not just small children; he is unabashed with his use of the term. David Almond’s Slog’s Dad leans close to Tan’s work with its pages of text alternating with pages of Illustrations (framed out and sequential) by Dave McKean. 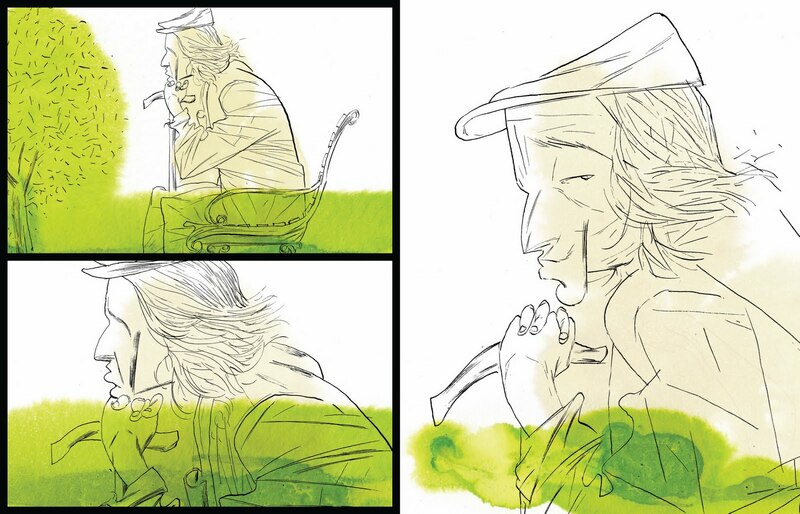 The Illustrated pages, after establishing a beginning, before Almond’s beginning, seems to plumb the emotional depths of the novel as well as the more magical aspects of Slog’s and his dad’s beliefs. However Slog’s Dad might be categorized descriptively, it is a marvelous creation, an incredibly effective storytelling device. There are no chapters, the story is fairly short, a pint’s telling if you don’t gulp. The transitions between Almond’s text and McKean’s sequences are smooth and they aid one another in the piecing out of the text’s story. You understand that Slog’s Dad is dead, then you learn who he was and what happened before returning to the park and Davies doubts. The story leaves you on a fence, able to explain away either side using both text and culture as evidence. Slog’s Dad does wonder: “Can it be that some mysteries are never meant to be solved? And that belief, at times, is its own reward?” Davie’s skepticism is as strong as Slog’s embraced belief, and the Reader is placed in the middle—simultaneously comforted and discomforted by belief. McKean’s images are without narrated text (if it has text at all), but are by no means silent. And he shifts his approach with each portion as it feels necessary to depict the story’s intentions. Rough line work with watercolor, to photograph under ink and paint, to—McKean’s signature is all over this piece. 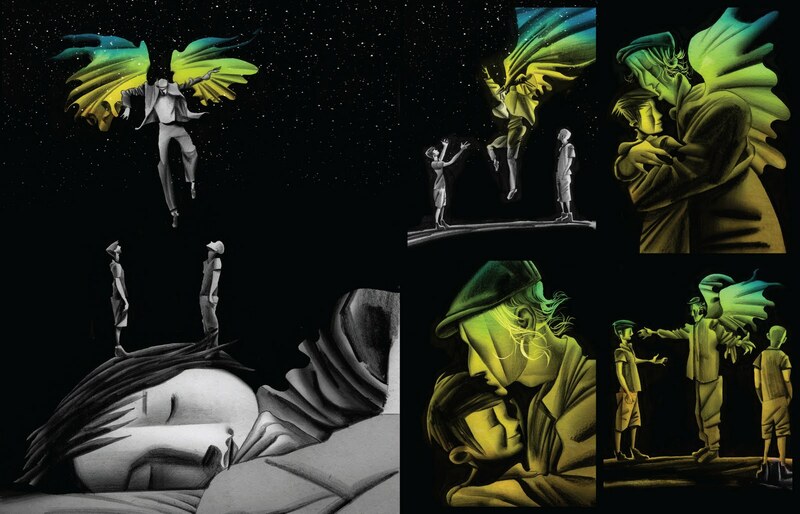 I really responded to the paper-cut dad sequences and the borealis dreaming; which were no less full of portent than the superhero section; the above sequence is terribly sad (helpless). Even with the shifts, McKean provides visual cues so you know which character is which. What is nice about how Slog’s Dad works is that McKean isn’t illustrating what was already set down in text by Almond. His is another portion of the story. 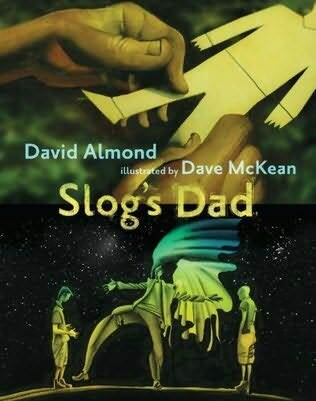 While Almond uses Davie as his first person narrator, McKean uses Slog as his. The writing is so clean and perfectly played out; quietly ambiguous in such artful ways when tension is necessary.It falls into nice rhythms. And I appreciate how Almond translates dialect alongside tension and sorrow and inevitable uncertainty. One day late in August, Slog’s dad caught me looking. He waved me to him. I went to him slowly. He winked. He looked down to where his legs should be. “Dunno, Mr. Mickley,” I said. I started to back away. The scope of the novel physically is small. A small neighborhood, a humble worker (a binman (garbage man)), two boys who are best friends, a normal afternoon in the Spring. McKean begins the story by moving us from Universal proportions to a park bench with a stranger sitting on it. Or is he mapping Mr. Mickley’s return? Either way, the story is titled Slog’s Dad and it intimate in its portraiture. On an emotional and spiritual front, it isn’t decisive or interested in any grander supposition than this small piece of earth and these few people. As if grief is that personal. As if in the end we find our own ways of dealing with illness and death and what comes after for those living. In the end, Slog’s Dad leaves the interpretations and their implications to the Reader. It’s just telling a story. The recommended ages are 10 & up; I picked it up in the juvenile fiction section of the Library. Fans of McKean will undoubtedly want to have a look at this one. I think Slog’s Dad would speak to anyone at any point, so I wouldn’t just leave this one for a special occasion like grieving periods or spiritual upheavals. That said, I don’t know if everyone would care for this as I do (though I am sure some will like it more)–even as I think it a beautiful piece of Literature. Images: (1) pgs 6-7; (2) US edition cover; (3) 32-33, there is a lovely repetitive use of image from this one. (4) 24-25. note the smile on sleeping Slog’s lips, he was crying on the previous pages. (5) 36-37; on the cover you see the painted Slog, and image taken from the first sequence with the cut-out dad, in this second sequence Slog has changed when nothing else has (except, strangely) in that (God’s eye) overhead shot of the first panel left). (6) UK edition cover, 2010. *: as found at the back I though interesting: Slog’s Dad (text only) by David Almond has a 2006 copyright from when it was “commissioned as a short story by New Writing North and published in So What Kept You? 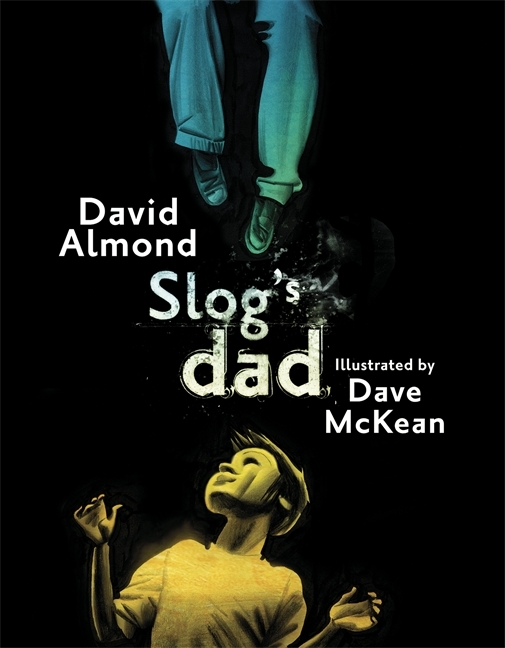 (Flambard Press, 2006), then was runner-up in the 2007 National Short Story Prize, which led to its being published in The National Short Story Prize anthology (Atlantic Books, 2007), In Prospect magazine, and broadcast on BBC Radio 4.” Dave McKean’s illustrations have a 2010 copyright. I am a fan and you are correct, I do undoubtedly want to check this out. Unfortunately I do not have it in my local library so I’ll keep an eye out for it next time I am at the bookstore. Seeing McKean’s work always brings up such great memories. I first discovered it on the covers of Gaiman’s Sandman series, just as the comic run was coming to an end. I can trace back to that moment (of reading Sandman in one giant rush over a week’s visit to NYC) as a turning point in my tastes in art, literature, etc. Not so much a turning point as an expansion of my consciousness about what else was out there and what I might like in addition to the things I was already fond of. I never tire of his work. I wish he would do another Mirrormask type of film. That is of course ME! Carl V.
I did enjoy his work in the Sandman series, where I first noticed him, but it was his work on Gaiman’s Mr. Punch that hooked me but good. I read in this interview about a film called Luna. I’ve looked for it on IMDb, but haven’t researched further, which I need to. I’d like to get it as it looks to have all his short films. I am particularly fond of Mirrormask in part because it is a spiritual sequel to Labyrinth which is one of my favorite films of all time and in part because McKean and his small crew just created something pretty darn special. And of course Gaiman’s writing shines through as well. Not sure what my favorite McKean illustrated book is, but it might just be Wolves in the Walls.